Stop by any time to visit us and to see our Family Fun and Fitness Center! We are open 7 days a week. All of our programs are centered around enhancing each child’s self-esteem,	while encouraging fitness in a fun and safe environment! Just	contact us with any questions. We are located at 49 Powers Road in Westford, Massachusetts. ¼ Mile	From the Nashoba Valley Ski Area. Click here for directions. Nashoba Gymnastics Academy at	One Stop Fun is fully equipped with Olympic gymnastic apparatus and colorful pre-school	mats of all shapes and sizes. In addition, we have a full-size trampoline with safety net around it,	a foam pit (containing 10,000+ blocks of foam) with a rope, rings, bar	and zipline, and a 40′ Tumbl Trak™. Visit us for the latest styles in gymnastics apparel. We sell GK and Destira	leotards, shorts, t-shirts, hats and other gymnastics supplies. Stop by	any time to browse. At our Indoor Playground kids get to be kids & can climb, slide, jump,	bounce, bump & have fun! Our funtastic play structure has three stories of tubes and tunnels for	climbing and exploring, a wave slide, a spiral slide and its own toddler	area for hours of fun and adventure! Our 1,500 square foot exercise studio is equipped with a padded hardwood	floor, mirrored walls and wall bars. It is used for our Karate program,	fitness classes and dance activities. 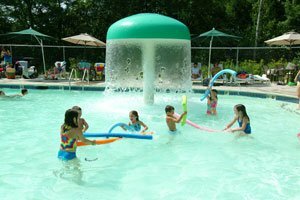 An	Outdoor Interactive Pool Designed Specifically For Kids! With 5 water slides, water features and	a mushroom spray. Our decorated	party rooms are the perfect venue for gathering family and friends! They include dining	tables, a changing area, and lots of seating for the adults to relax while	the kids have fun.